Who Is, Or Rather, Was Chris Marker? Posted on January 20, 2014 by Peter Schilling Jr. This is the question that has dogged filmmaker Emiko Omori for over a decade, and guides his documentary To Chris Marker, An Unsent Letter, screening tonight and tomorrow at the Trylon. Omori had met Marker in 1974, after a screening of La Jetee, where he proceeded to try and convince Marker to be the subject of a cinematic homage. Startled, Marker simply said, “But I won’t be in it.” Originally thinking to title his project Portrait of an Invisible Man, Omori created a documentary of sorts, interviews of fellow filmmakers and fans, and images that might have inspired Marker. The result is an affectionate and mysterious movie which, though it may not be the documentary about Marker that his fans ardently desire, captures the essence of the man. 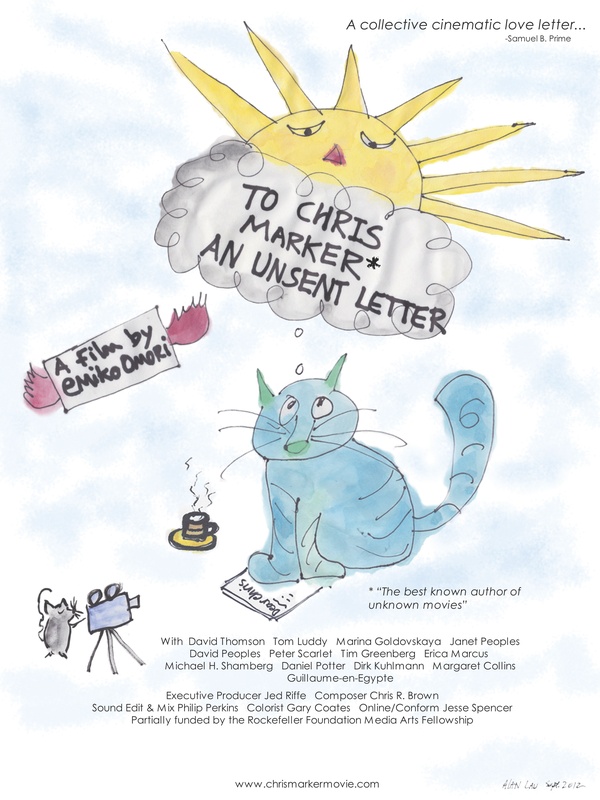 To Chris Marker, An Unsent Letter screens Monday and Tuesday evenings at 7:00 & 9:00 at the Trylon microcinema. Purchase tickets here.